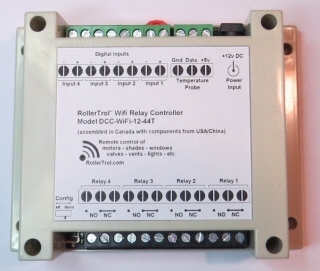 In the introduction to our 12v WiFi relay control device, we talked about how this unit uses your wifi router to communicate sensing data and to control relay outputs for motors, valves, lights, etc. The Android app allows you to use any type of Android phone or tablet that has WiFi capability, and we'll show you how to select a vacant IP address for the relay module in this article. You have to know a little bit about your wifi router in order to set this up properly, but it is not difficult. Most wifi routers have an 'admin' function that allows you to see what is already attached to the network, and you will use this function to decide what the IP address of your relay controller will be. If you cannot access your admin as per the procedure below, please check your router documentation for more info. http://192.168.1.1 (you don't have to use the http:// part as most browsers handle this for you). If you have never accessed this before, you may be challenged by a dialog box requesting a username and password, and if you don't know it, you should be able to find the default setup in your router documentation. If you don't have your router manual, you can usually find it online by searching for your model and brand. Please note that you should always change your username and password from the default settings for security reasons. 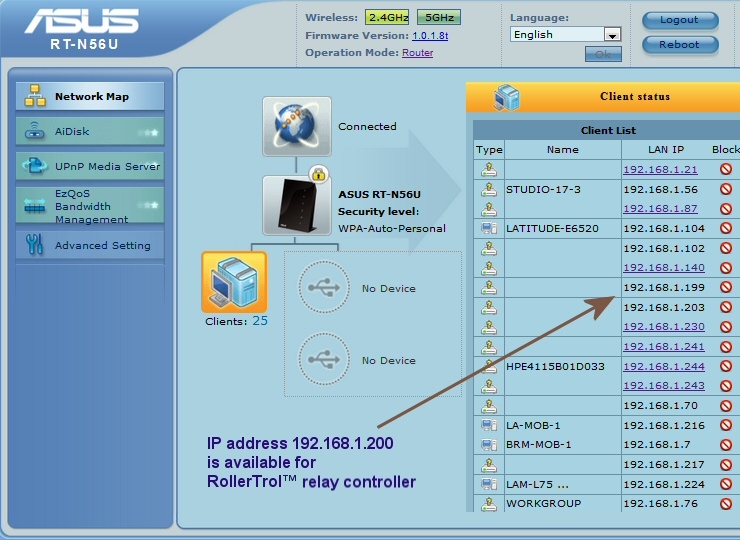 Here's a screenshot of our Asus router admin screen, showing a list of 'clients' (ie devices connected to the wifi network, each with a unique IP address). We have perhaps a dozen laptops, half a dozen wifi printers, a bunch of tablets and phones, and several home automation controllers. Your list may not be as complicated, and your screen will likely look different, but the basic methodology is the same for most routers. Basically, you make sure all your network devices are ON, and you may have to refresh your admin screen if you forgot to switch something on (such as a wifi printer or scanner). Then you would examine the client (device) list to see what IP addresses are not used. In our list below, we selected 192.168.1.200 as our target IP address that will be assigned to the WiFi relay module. Once you have determined the available IP address that you wish to use, you can assign it to your wifi router using the configuration procedure in the Android app, so that the relays, inputs and temperature readings become addressable, with the information appearing on your Android device screen. We will cover that procedure in the next article.